In shielded metal-arc welding, the intense heat from an electric arc is used to melt and fuse metals to form a weld. It is one of the oldest and most widely used welding processes. Although used chiefly for joining iron and mild steels, shielded metal-arc welding is well suited to maintenance tasks because the equipment is relatively inexpensive, simple to operate, and can be used for welding many different kinds of metals. Below, you will find explanations describing the shielded metal-arc welding process and how the welding machines and accessories are set up and used. You will also find information on selecting an electrode. The personal safety equipment and precautions are also described. A typical SMAW outfit consists of an electric welding machine, two welding cables, a ground clamp, an electrode holder, and a covered metal electrode. 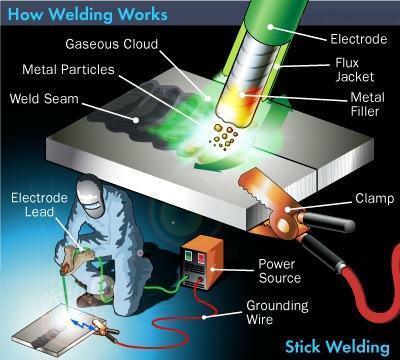 Electric current from the welding machine is used to form an electric arc between the tip of the electrode and the work. Welding is started by touching the end of the electrode to the base metal, then lifting the electrode about ¼ inch. This forms the arc, which produces temperatures up to 5550°C. The intense heat at the arc area instantly melts the base metal and begins to burn the covering off the electrode and melt the core. The melted core becomes filler metal for the weld and the decomposition of the flux forms a protective gaseous atmosphere around the arc area. The gas forms a shield against contamination from oxygen and nitrogen in the surrounding air. Additional shielding is provided by the electrode flux, which forms a deposit called slag. The shielding gas is ionized, and conducts electricity and maintains the stability of the arc. Either direct current (DC) or alternating current (AC) is used. The arc voltage or working voltage is the voltage present in the welding circuit while an arc is struck and welding is being done. The arc voltage ranges from 15V to 40V depending on the arc length. The open circuit voltage is the voltage generated by the welding machine when no welding is being done. Open-circuit voltages are normally set between 50V and 100V, but drops to the arc voltage level when an arc is struck and welding begin. In any electrical circuit, there is a correlation between the voltage, current and the resistance. The best results are normally obtained with an arc length about the diameter of the electrode. When the arc length is increased, less current flow occurs because of the increased resistance. The result is a cooler arc and a greater tendency to spatter. There will be less penetration of the weld, increased exposure to oxidation and contamination, and an erratic, unstable arc. When the arc length is reduced, less resistance more current flows with less voltage and the arc becomes hotter. With thin material, the heat can melt a hole in the welding, porosity, and undercutting of the adjacent base metal. For DC machines, this is important. When the electrode is negative and the work piece is positive, this is called Straight Polarity. The opposite of this is Reverse Polarity. DCSP or direct current straight polarity is characterized by faster melting of the electrode, the weld puddle being broad and penetration into the base metal is relatively shallow. This is used when fast welding speeds and high deposition rates are required. DCRP or direct current reversed polarity results in a hotter arc, making deeper, narrower weld puddle. This is used for structural welding, multi pass welds, and applications requiring deep penetrations. Most electrodes are designed to be used with only one polarity. Many types and sizes of welding machines are used for shielded metal-arc welding. The current of a Constant-Current type does not change significantly in variations in arc length. This is preferred for manual welding operations. The Constant-Potential type of welding machine adjusts the current according to the arc length. If used in a manual operation, the unavoidable variations in arc length will produce large fluctuations in the current, resulting in an unstable, non-uniform arc. For automatic operations, the constant electrode feed rate establishes a stable arc and uniform arc length. The current rating of the machine is its maximum current output. A current rating of 400 amp means the machine can deliver up to 400 amps of welding current. The duty cycle rating of the machine is the safe operating capacity for non-stop welding. This is expressed as a percentage over a 10-minute period over which a machine can deliver its rated maximum welding current output without damage or overheating. An 80 percent 400-amp machine is one, which can deliver 400 amps of welding current for a total of 8 minutes out of every 10, and must idle at least, 2 minutes out of every 10 for cooling. The tools for SMAW are: cables, holders, clamps, chipping hammer, wire brush. The protective equipment are face shield, goggles, apron, gloves, shoes, long sleeved shirt. The protective equipment is to avoid eye injuries, and burns. Also there is a need to prevent electric shocks, especially in wet areas. Electrodes are classified by their core material: mild steel, high-carbon steel, special alloy steel, cast iron, and non-ferrous. Mild steel electrodes are the most commonly used. In general, the electrode core material is matched as closely as possible with the composition of the base metal. Electrode size varies with the thickness of the base metal. The size and characteristics of the selected electrode determine the arc current settings on the welding machine. Normally, the range of recommended amperage for the electrode is given by the manufacturer. 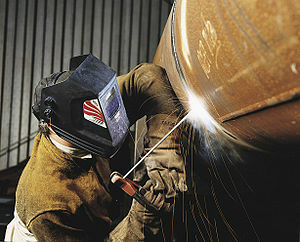 Observe fire precautions before starting to weld. No combustible should be near the work area. With the electrical power still off; clamp the earth wire to the work piece and the electrode on the holder. Turn on the power. To strike an arc, position the end of the electrode about 1 inch above the weld start point. Lower your face shield and with a rapid tapping of scratching motion, touch the electrode to the base of the metal. Immediately after the contact, raise the end of the electrode slightly to establish an arc whose length is approximately equal to the electrode diameter. If you do not raise the electrode fast enough, it will stick to the work. Twist or bend the electrode to break it free. If the electrode does not break free, quickly release it from the holder. With a little practice, you can learn to strike an arc without the electrode sticking. When the current settings and a proper arc length is maintained, a continuous cracking sound is heard while welding. A humming sound indicates that the arc length is too long or the current is too high. Arcs too short make a popping sound and may flash on and off, indicating the electrode is sticking and short circuiting to the base metal.